Just like a family tree, the main trunk expands to give way to branches which divide even more to reveal connections of kinship. We will use the same philosophy to aid in the naming of binary compounds. 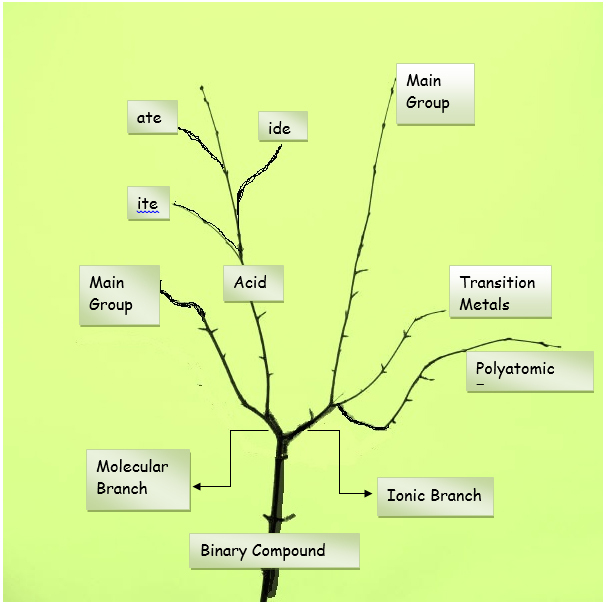 “Climb” or follow the branches as they lead to you to identify the type of compound you have. Then use the corresponding naming rule to name the compound. Follow these guidelines or you may find yourself out on a limb! Begin with asking: Is this compound ionic or molecular in nature? Then follow that branch to find subcategories stem from it. Recall that ionic compounds are easily identified by a metal + nonmetal pairing while molecular compounds contain two nonmetals (including those pesky polyatomic ions). Using Polyatomic Ions: For Main Group metals, name the metal followed by the name of the polyatomic ion. For Transition Metals, the rules in section c apply: so give the name of the first element (cation) followed by the charge in Roman Numerals in parathesese then the name of the polyatomic ion. Exception: For the FIRST nonmetal only, it is not necessary to note “mono” to indicate that there is only one atom; for the second nonmetal, however, you should.